When faced with limited time, most triathletes would prioritize a swim, bike, or run over a strength workout. But not two-time IRONMAN World Champion Miranda Carfrae. According to Tri Active Endurance owner Rob Reinhard, 99 percent of the time, she prioritizes her heavy lifting strength workout1. For a long time, this philosophy seemed counter intuitive. Many believed that heavy lifting added muscle mass and hampered endurance performance. However, in the first article in this series, we discussed the benefits of strength and power training in a well-designed training program2. The numerous benefits far outweigh the fear of carrying added weight. A common mistake made by endurance athletes is that simply adding basic resistance training is enough. In the same way that daily jogging a leisurely mile will not elicit significant race day benefits, simple resistance training that does not challenge you will not change you. In a 25 week study of sixteen elite cyclists, nine included heavy resistance training along with their endurance training, whereas seven simply cycled. The nine cyclists who included heavy lifting increased their performance of the isometric half squat, peak torque during the pedal stroke, lean lower body mass, and improved results in four power tests, including a 40 minute all-out time trial3. Another study examined three endurance running groups and incorporated different types of training into their programming. One group underwent maximal strength training, another performed basic resistance training, and the final group served as the control group. The maximal strength group showed significant increase in 1 repetition maximum (+6.17%), and running economy (+16.34%) whereas the other two groups failed to show any improvement4. Going to the gym and performing 30 reps of bicep curls, hundreds of crunches, or attending a random boot camp class doing endless burpees, will not enhance race day performance. However, a carefully designed year-round progressive training program, as evidenced by research, could be the ace up your sleeve. In our last article, we discussed first developing a solid foundation of strength and mobility while discovering limitations. Loading can begin after establishing a solid foundation, managing weaknesses, and learning proper form. The next step in creating a strength program is to establish a schedule as a guide to goals. Essentially, the schedule acts as a map where staying on course becomes a priority or results will suffer. The best strength training program will begin early in an off-season and will show progression until the competitive season begins. Once the competitive season arrives, strength training must be planned carefully to optimize recovery. Strength training workouts that elicit a lot of soreness should not be used near competitions or in proximity to difficult endurance workouts. The strength program is meant to augment the endurance program. So how should you begin incorporating heavy lifting into your weekly training program? Strength training programs should revolve around multi-joint exercises and simply rotate through different numbers of sets and reps. For example, early in an off-season, more repetitions (8-12) can be used as general physical preparation for the upcoming training season. Another example includes dropping the number of reps to a lower count (3-5) in order to elicit more strength gains by going heavier. With all of this in mind, a good focus includes high volume (high set and rep counts) early in the off-season when soreness is not a factor. Toward the end of the off season, the volume will diminish and the weight used on each exercise will increase. Leading up to a race, reduce the number of sets and load. This allows the body to fully recover so that performance gains can be optimized into race day performance. A breakdown of how to use these multi-joint exercises is listed below. To view how to properly perform each exercise, please refer back to part 1 of this blog. All exercises are done as 5 sets of 10 reps. The weight on the bar should be dictated based on how many reps you have left in the tank after completing 10 reps. Aim to have 1-2 reps left in the tank. This type of training is used to create a strong foundation and improve work capacity. Work capacity is how much an athlete can withstand. As an endurance athlete, you must have a high work capacity in order to be successful. All exercises are performed as 5 sets of 5 reps. Gradually introduce higher training loads. If the weight is too heavy to complete the lift properly then it will not serve to improve performance. All exercises are performed as 5 sets of 3 reps. These workouts should focus on increasing load, maximizing power output with each exercise through bar speed, and maintaining proper technique. All exercises are performed as 3 sets of 4 reps with a lighter load in order to taper off before race day. This will help with recovery and allow for highest performance capability on race day. Rest. The focus this week will be on the upcoming race day. No strength training this week. Focus on recovery by stretching, performing soft tissue massage, and simply resting. All exercises are performed as 4 sets of 5 reps. This is meant to gradually reintroduce a training intensity necessary to elicit performance results. Recovery is often difficult after a big competition so make sure you are ready to return to training in order to avoid potential injury or overtraining. Try to avoid scheduling weight training and a long endurance workout on the same day, which could impede results in both. Recovery is a key factor. 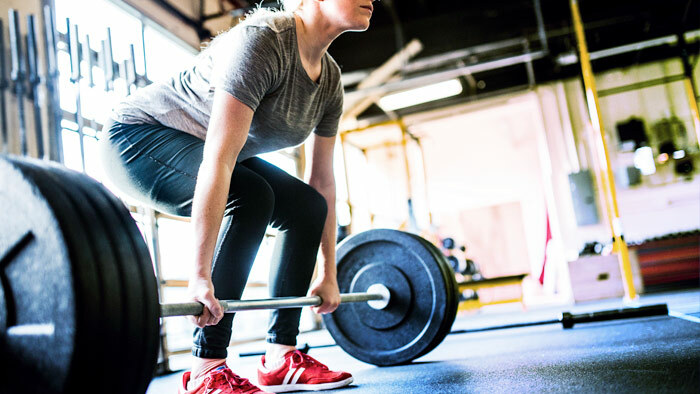 Adding weight training into your endurance training can be instrumental in performance improvement but without recovering properly, it will all be for nothing. Make sure to stretch properly and foam roll before and after every training session. Strength training is an accessory to what you are doing on the bike, in the pool, or on the road. Focus on the why behind the ancillary work and performance gains will result.